When Juan Holgado suggested we go for a walk along the GR 48 I jumped at the opportunity. Although it's been a mild winter in the UK it felt like a long time since I had done any serious walking. I was ready for sun and some long days on the trail with Juan felt like ideal preparation for my six week trip to Nepal which starts in March. Better still Juan was doing all the hard work, putting together the itinerary and booking the accommodation, all I had to do was turn up and keep up. The only downside of letting Juan do the planning was that he determined how long the days were. Juan is a serious dawn to dusk walker and the schedule he put together involved walking 160 kilometres in four days. Despite all my best intentions I had not kept up anything like the level of fitness I had acquired on the E4 last year and keeping up with Juan, who runs/walks 20 kilometres every day he is not on the trail, was always going to be a challenge. Still the GR 48 was a great choice. It's easy walking, generally between 300 and 800 metres, along excellent trails through really interesting countryside. 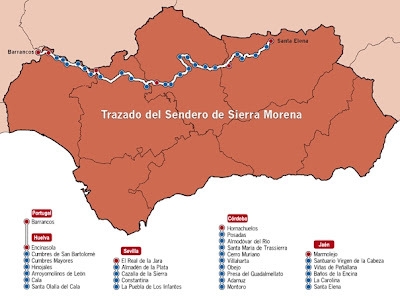 It's a relatively new trail, going, west to east through a series of natural parks, from just inside the Portugese border for 550 kilometres through the Sierra Morena in the north of Andalucia. 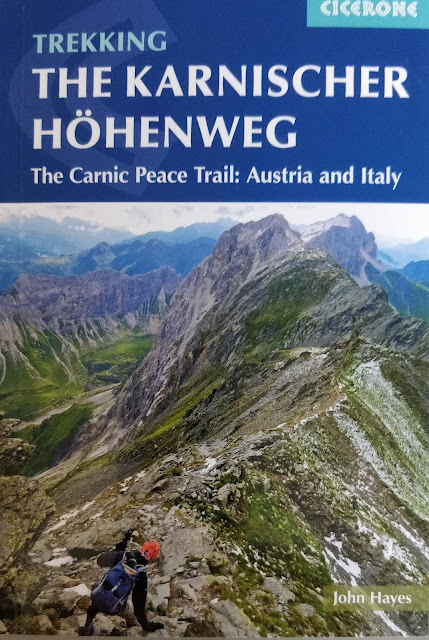 Clearly part of an initiative to promote walking it is supported by one of the best web-sites I have seen with guides and GPS trails available for download. The guides on the web-site are in Spanish but English language versions were forwarded to me by a very friendly help desk, via their Facebook page. It's a really interesting part of Spain for a walk. The proximity of the border with Portugal and a former border between Castille and the Moors has left a legacy of fortified hill top towns and splendid castles many of which look as good as they must have done in the middle ages. If you don't want to spend all the time walking then there are places to stay and plenty of things to see. On the other hand the beautiful and distinctive landscape provides plenty of encouragement for some serious walking. It's a classic pastoral scenery with abundant evidence everywhere of a long history of men rearing animals. Dry stone walls enclose the fields and provide a boundary for ancient trails but it's dual use of the fields that make the scenery so distinctive. There are lots of trees, holm oaks and cork oaks and occasionally some abandoned olive groves but the trees are arranged in a spacious way, providing shade for the animals and enough light for the grass to grow. The trees also provide shade for the walker but at this time of year, when the sun is still low, it's the mix of light and shade that is so attractive - it's the gentle light you normally associate with a like a summer's evening but here, and in the early spring, it lasts all day. 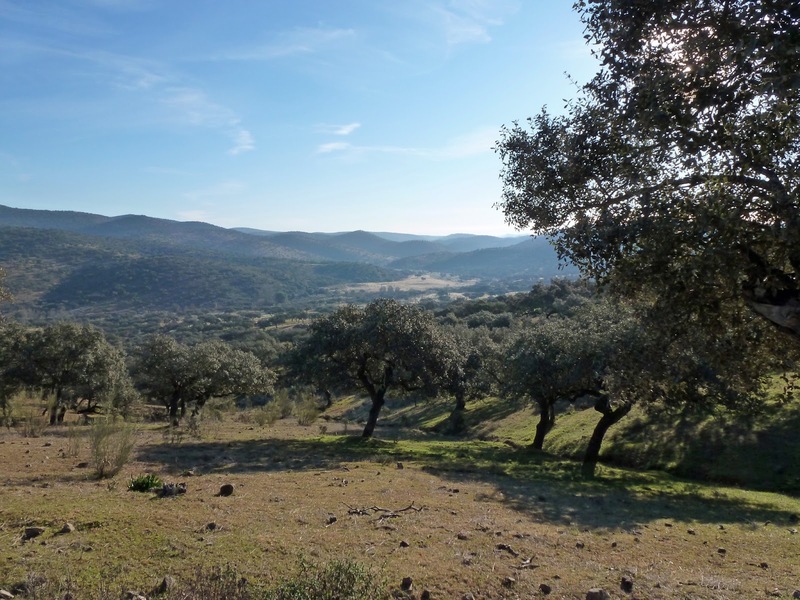 The scenery by the way is superbly captured in the film Entre Lobos although the filming took place further each along the route in the province of Cordoba and the Natural Park of Sierra de Cardena y Montoro. The trails themselves are also special. Nearly all the route from west to east is off-road and for the first 120 kilometres at least, it's along ancient trails (caminos) which would have been used to move animals and goods between the little towns and even contraband across the border with Portugal. Some of these trails are in pristine condition which the original paving and culverts still intact, absolutely wonderful. Although animal husbandry is the main human influence on the landscape, other human activities have also been at play, particularly mining. The huge and only recently abandoned opencast mine near Cala and the new mine near El Real de la Jara suggests that this particular dynamic has not yet played itself out. It would be wrong to suggest that animal husbandry in the area is finished, it just doesn't involve so many people. The abandoned farm houses and olive groves all evidence the history of rural depopulation that is much more recent in Spain than in other parts of Europe but animal husbandry still goes on and you will see the full range of farm animals on the trail. 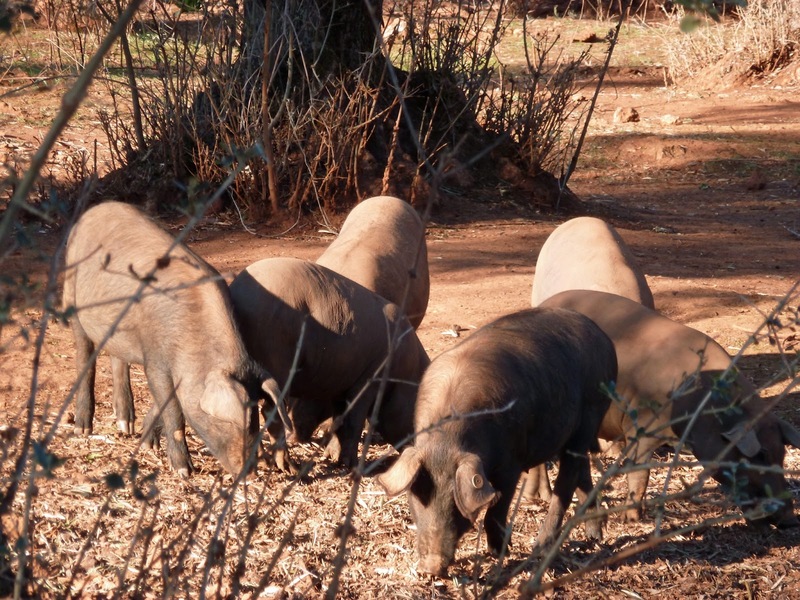 My own favorite were the little black Iberian pigs which you will often find scurrying about, eating acorns, on your side of the wall. If you have to come back as a farm animal than try and book a berth to this part of Spain, it looks to me like cow heaven. There was not quite as much wildlife as I had hoped for, nothing like the Cazorla National Park on the other side of Andalucia which I walked through last year on the E4/GR7 last year. I'm not sure if it's because I was a walking through Cazorla a month later, because southern Spain is in the grip of a prolonged drought, or because there just isn't as much wildlife. We did get see Griffen Vultures, Herons, Storks and every morning heard the clack clack of the Hooper bird. The drought also had an impact on the colours, green but not the lush green you would expect this early in the year. It also meant that the rivers which would normally involved fording knee deep could be crossed easily and without the change of walking gear which is usually the order of the day. Given that this is a relatively remote part of Spain accommodation was good, available and excellent value. Personally I prefer to stay in the little hotels if you get the choice, particularly the ones which attract local custom. The atmosphere is warm and they are always very friendly. If the can't get a hotel than there are lots a casa rurales although at this time of year they can be a little bit cold (temperatures drop below zero when the sun goes down). The guides on the GR 48 website give the information on accommodation. I've did a walk diary as I went along and if you're interested you can get a sense of the itinerary and what it felt like as I was travelling along from the links below. I know Juan is also publishing a more detailed description of the walk on his website and indeed, will be completing the rest of the walk over the next few months. In summary I think this is an excellent walk, a particularly good winter walk option. It's an easy place to get to from a much darker northern Europe and you can easily add a couple of days to your trip by staying in Seville. Nice to hear from you, sorry that I have been a bit slow replying, I have just got back from a trip. I didn't download the English language versions, the GR 48 people sent them to me. There is an email address at the bottom of the website, try sending the request to that address. I can't really remember any bits that would be too tough for a mountain bike but you might want to check with them. You can get the GPS trail from the web site as well. It's a great walk but I would definitely avoid the summer months - it would be too hot. So better March April ? Christine's website is very good - really helpful information. The guidebooks on the website are available in English as well as Spanish, and there are GPS tracks also. Thank you for the write-up - it looks great! I am planning on doing this walk, but am thinking about walking towards Portugal. From the official website, it looks as though the signage caters for walking the track in either direction, but I'd be interested in feedback from someone who has been on the ground, so to speak. How did you find the signage in the parts you walked? Does it indeed cover travelling in either direction? Also, was it expensive to stay in the casa rural in Cala? I'm having trouble finding accommodation there online, and I'll be on my own and on a budget. As far as I can see, you usually need to book the entire house(?) I have some Spanish, but it's certainly not up to haggling. Hi there, glad you found the description helpful. I'm pretty sure the signs work in both directions but to be completely honest its something I didn't check. My Spanish walking companion, Juan Holgado (juanholgado.com) has information on the whole route and you might want to double check with him. You can also download a gpx file if you're into that sort of thing (I am). On the casa rural - I've stayed in lots and they always charge just for the room, not the whole place, that's the normal approach in Spain. Of course its worth checking that they are open. Hi John, could you tell me how you to to the start of the walk as Ican't find a bus from Seville. I'm pretty sure that I got there using two buses but I can't remember how. I've checked Rome to Rio, usually a really good way of finding bus routes, and it's recommending a bus and a taxi. It does sometimes miss local routes if they have no web presence but not often The only other thing I can suggest is making contact with the GR 48 people via their website.